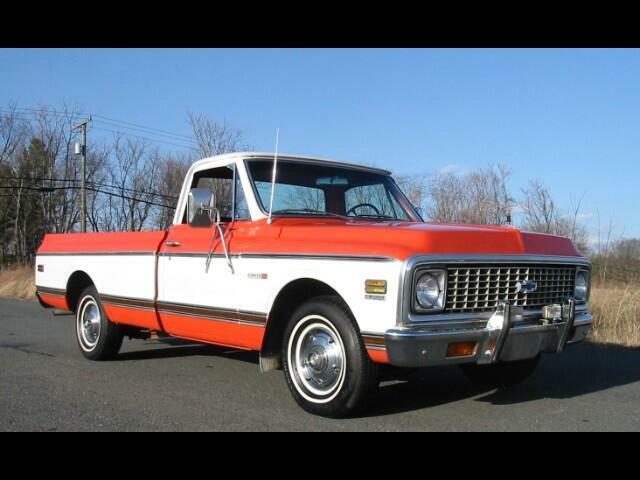 This is an original 1972 Chevrolet Cheyenne long bed pick up with 350 cu in V8, 4 BBL carb, dual exhaust, power steering, power disc brakes, factory air conditioning, all exterior decor chrome, two tone paint, and the Cheyenne package with upgraded seating. It was sold new in Tennessee and stayed in northern Alabama until I purchased it and had it delivered to Virginia. It is an excellent driver. All body panels are original, as is the paint, and other than some very minor surface spots, Undercarriage is rock solid. Truck has dual exhaust with flowmaster mufflers. Message: Thought you might be interested in this 1972 Chevrolet C/K 10.